Proved 16th January, 1556-7, at Lichfield. To be buried in the Parish Church at Eyam. Whereas my late brother Humfrey Stafford, by his will, bequeathed to his late wife Luce, my sister in law, all his lands etc. which should descend to his five daughters, Ales, Gartered, Anne, Katryn and Dorytye, until the youngest attains sixteen. He, my said brother, also gave his said wife Lucye, in his goods, and appointed her sole Executrix of his will. Whereas my sister, in her late widowhood, and by her will, bequeathed all her right to the above bequests, to me her brother-in-law, Rowland Stafford. Executors; Otewell Alen, George Blackwall, and John Fitzherbert, and give to them the guardianship of the said Alice, Gartered, Anne, Katherine, and Doryty. And whereas, my said brother Humfrey in his lifetime, did give to Robert Wylcockson of the Grange, a house etc in Youlgrave, for x [Ed: sic] years, after the death of the widow, being then alive and also my said sister, in her life-time did assign the same. I have given unto my mother all my goods, as well real, as personal, conditional upon her paying all debts owing to my father by brother Humfrey, and me. [Page 290] I have a lease of the ground at Abney. I desire my said mother to leave the same to my servant John Harryson. Witnesses; Sir Wm. Baker, clarke, Parson of Eyam; Sr Wm Fyldefend, Clark, Vicar of Tyddeswell; and John Harryson. Proved by Ottewell Allen and Geo. Blackwall, power reserved to John Fitzherbert. Will of Anne Stafford, widow. Dated 5th June, 1560. Proved at Lichfield, 31st Aug., 1560. To be buried in the Parish Church of Eyam. Out of her estate to be paid mortuary, and funeral expenses etc. Also “certain Debts for which John Harryson is bound to the Executors of my son Rowland Stafford, which my son dyd owe to the children of Raffe Blackwall”. “To John Savage my son a yoke of my best oxen”. Thirty wethers and 30 ewes are also left to him. To Alice Stafford, my daughter, my mare. The witnesses are John Nedham, curate, William Roland, Thos. Moslye, Philip Roland, and John Mylnes. It will be noticed that in the three yeas that had intervened between these two wills, Dorothy, the youngest daughter, had died, and Anne, the widow of Humphry Stafford, sen., had evidently had the care of her son Humphry's children since the death of their parents, for she. speaks of her grandchildren as though they were her own. They. must, too, have been quite. young, for Francis Bradshaw, the future husband of the third daughter, was at this date only five years old. Although she calls her eldest daughter Alice by her maiden name, she must have been already married, as she mentions her husband, John Savage, as her son. Thomas Savage, one of the supervisors of the will, was his father. Alice, married John Savage, of Castleton, by whom she had seven sons and two daughter. She inherited lands in Eyam and elsewhere, which her grandson Humphry sold. Her husband died 1605. The family is believed to be now extinct. Gertrude, married Rowland Eyre, of Hassop, by whom she had eight sons and four daughters. She inherited the manor of Rowland, which has never since then been alienated front the Hassop estate. The family became extinct in the direct line on the death of Dorothy, generally styled Lady Newburgh, 22nd November, 1853. Gertrude died in 1624, and lies buried with her husband in Longstone Church, where... [Page 292] there is a brass in her memory with the arms of Eyre impaling Stafford. Katherine, married Rowland Morewood, of The Oaks, Bradfield, co. York, and by him had seven sons and eight daughters. She brought her husband estates at Middleton Bank, Eyam, and Riley, all of which werfe sold early in the nineteenth century to James Furness and others. She was buried in the chancel of Bradfield Church, 16th July 1619. There is a brass in the same church to the memory of her son John Morewood, of the Oaks, and Grace (Hurst) his wife (both of whom died in 1647), on which are quartered the arms of Morewood and Stafford of Eyam. Dorothy, died, a child, between 1556 and 1560. The third daughter, Anne, was married about 4th May, 1565, to Francis Bradshawe, eldest son and heir of Godfrey Bradshawe, of Bradshaw, co. Derby. As the bridegroom was born 17th February, 1555-6, he was at that date barely ten years old, and his bride was probably not as old. She was then in the wardship of Robert Eyre, of Edale, who had received her from the guardianship of George, Earl of Shrewsbury. In 1568, a deed was executed to enable “Francis Bradshawe and his wife to peaceably enjoy a fourth part of the lands lately the inheritance of Humphrey Stafford”, and on the 10th September, 12 Elizabeth, 1569, an order was made by George, Earl of Shrewsbury, lord of the manor of Eyam, with respect to the lands which Francis had acquired with his wife. In The Reliquary, vol. x., p. 236, an account is quoted “from Francis [Page 293] Bradshaw of Eyam, gent., for £60 rec.d. from Rowland Eyre of Hassop, for his right in the Manor or Rowland, in the right of Anne Bradsha his wife, one of the daughters and heirs of Humphrey Stafford, of Eyam, late deceased”, which said lordship was by part of the lands by John Manners, Esq. who was at that time High Sheriff. A Receipt for Anne's share, dated 20th April, 20 Elizabeth, and signed by Francis Bradshawe, is among the Hassop Deeds. The lands allotted to Anne Bradshaw included the whole of the townships of Bretton and Foolow, which as it has been proved, can be traced back to the year 1400 as Stafford property, as well as many messuages and lands actually in Eyam, including the ancient mansion house situated on the slope of a hill just outside the village. This house was pulled down by her son and another erected, probably about the year 1630. A very interesting account of this old hall, written in 1861 by Mr. Peter Furness, appears in The Reliquary, vol. ii., p. 219, from which the above illustration is taken. He says “it was intended to be hung [Page 294] with tapestry, which came to the place but was never put up, and that an old man who was born in this part of the hall informed him that when a child he saw the tapestry lie in a heap in a corner of the chamber, where it rotted away”. Mr. Furness goes on to say that judging from the extent of the foundations, removed some years since, the hall of the Staffords must have been an extensive building. “The whole had a flat roof covered with lead. One room was said to have been very large, the beams ornamented with carvings of shields of arms, and a fine traceried window looking east. In the room was a large shovel board of massy oak.” The tradition that a very large establishment of servants was maintained by the Staffords is corroborated by a big baker's oven, destroyed some years ago; the slaughter-house, usually part of the outbuildings of a mansion house of any importance, however, being then in existence. Ann Stafford never left the hall of her forefathers, for there she and her husband took up their abode, and lived out their joint lives. When she died is unknown. She was, however, dead in 1606. Seven sons and four daughters were born to her, and of these Francis, the eldest, High Sheriff in 1630, began his married life at Bradshaw Hall, near Chapel-en-le-Frith, and died there in 1635. His brother George, however, his eventual heir, from whom is descended the present representative of the Stafford and Bradshaw families, lived for the greater portion of his married life at Eyam Hall, dying there in June 1646. The marriage of his eldest daughter is the first entry on that page of the Eyam registers which tells the pitiful tale of the first lives claimed by the plague, which drove his widow and her daughter out of Eyam in 1665. Mrs. Bradshawe then took refuge with her eldest son at Brampton, in Yorkshire, and from that time Eyam Hall ceased to be a residence of this family. 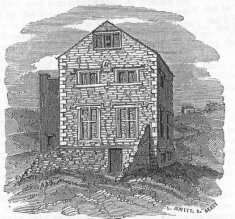 In 1676 a member of the family of Wright if Longstone built the residence now known as “Eyam Hall”, on a portion of their own estate, and “Eyam Old Hall”, as it then became in legal documents, was left to its present solitary and mutilated existence.